Love & Loyally: Holy Editing, Batman! I'm about 0% proficient in Photo Shop. If there were a percent below 0, that would be were I am in understanding how to use that dang program. Hi, my name is Jessica, and I survived law school and the bar exam, but I can't use the computer. Anyway, Lindsay tipped me off to Pic Monkey, an online editing program people like me can use for free. It blew my mind. Blew.my.mind. Here's a photo I posted on this here blog a couple of weeks ago. Here's the same photo edited with Pic Monkey. Uh yeah, mind still blown. Also, if you haven't noticed, my 'About Me' page got a little face lift. Those photos are Pic Monkey edited, too. So if you're book smart, but not Photo Shop smart, like me, then head on over to Pic Monkey. You won't be sorry. BTW, I wasn't compensated for this post. I just thought Pic Monkey was too awesome not to share! I'm linking up here and here today. I can't do photoshop either! I heard about Picasa from goggle and just went with that. You can really see the difference in the picture! I am TOTALLY with you on the photoshop thing! I wish I did and someday I will but right now Picmonkey works for me too! :) Stopping over from YOLO Mondays and look forward to following! 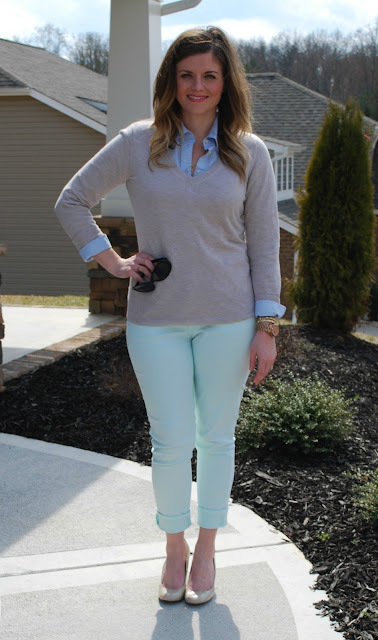 PS - your outfit is super cute, I'm on a mission to find mint pants! I love using PicMonkey, it's so much more user friendly than photoshop! I've actually never used PicMonkey. I am a big Photoshop girl. But love the editing here! Thanks for sharing!